Do you hear them? I do. It's the collective groan of gardeners across the country desperate to eat, cook, and preserve their stockpiles of late summer vegetables and herbs such as corn, tomatoes, peppers, zucchini, and basil. I'm here to help. Toss them all into a big pot for this Late Summer Vegetable Soup with Basil Pesto. You can double it, triple it and even freeze it. What more can you ask for? See that? It's quieter already. If you choose to freeze the soup to enjoy during the winter months, then undercook the vegetables and allow soup to cool completely before pouring into freezer-safe containers. 1. To make basil pesto heat 1 teaspoon olive oil in a small skillet over low heat. Add garlic, and heat through until slightly golden (about 2-3 minutes). Transfer to a food processor. 2. In the same skillet, add pinenuts, and toast 1-2 minutes, until golden; add to food processor. Add basil leaves, cheese, water, salt, and pepper. Pour olive oil though processor chute (or simply add with other ingredients), and process until smooth. Note: If you’re not going to use your pesto immediately, then pour in a small sealable container and cover with a layer of olive oil. This will prevent the pesto from turning brown. 3. Heat oil in a medium sized saucepan over medium heat. Add onions, carrots, and celery and cook 5 minutes, until onions are translucent. Add red bell pepper and zucchini, and cook 3 minutes, or until slightly softened. Add broth and bring to a boil. Reduce heat to low. Add corn and green beans; cook another 3-4 minutes, until string beans are cooked through yet firm. Add cherry tomatoes and 1/2 cup pesto; stir well to combine for about 1 minute and remove from heat. Taste. Season with salt and pepper, and add more pesto, if desired. If you prefer it thinner, add a little more broth. Garnish individual servings with shredded Parmesan cheese, if desired. 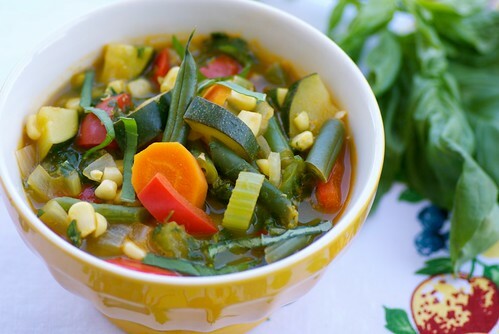 This soup is delicious Susan and the perfect way to use up those abundant summer veggies. Ooh...I often find vegetable soup quite boring. But the addition of pesto actually has me wanting to make it. Now! Thanks for sharing! What a gorgeous soup, and it would be so delicious with the pesto and all those vegetable flavors! What a fantastic idea to stir pesto into this hearty soup! I'm sure it packs a punch of flavor. Thanks so much for the link. great idea for using up veggies. I wish I had tons of summer veggies to put in this! Time for a trip to the farmer's market, don'tcha think? So sad for summer to go but I'm looking forward to those winter squashes almost as much...! oh yum...that looks so delicious susan! i just came home from a weekend away and i have a mountain of squash to deal with. good timing with the recipe! Too beautiful to eat! I love the addition of pesto here, and with a late harvest of basil on the horizon, I'm definitely going to try this recipe. I put up TONS of tomatoes in hopes of making vegetable soup this winter. Never thought to make it in summer! Awesome idea! And so very pretty. Wow, Susan! That looks amazing and so fresh! Great way to get a hearty dose of veggies! val-Thanks. It's a go-to late summer recipe for me. kim-The pesto definitely makes it more exciting! michelle-I adore winter squash too. Bring on fall! jennifurla-That's how I like it too. Oh wow, this is exactly what I need/want right now!! The perfect way for me to wind up summer :) And all the colors make me so happy! I want to dive into that bowl! I love a soup with lots of veggies, and the added pesto is such a wonderful idea. I have been on a serious soup kick lately. This sounds amazing! The best news I hear is when your Summer is finishing, I know it's nearly our turn to have all these pleasures in the South. Lovely soup. This looks like a heavenly tasting soup! I love the addition of pesto! oh my gosh, that soup looks amazing! I have a (large) bowl of garden veggies waiting for this soup! And I think I'll throw in one of my parmesan rinds I keep in the freezer for the broth...thanks for the mention on twitter! The taste of summer, isn't it? I do love a good September Minestrone. Wow, this looks so fresh and delicious. Would love a bowl! looks so hearty and delicious! it's been a while, I hope that you are doing well, Susan! cailin-The pesto adds so much flavor. gfgidget-I'm on one now too! rose-Ha! I hadn't thought of that! marla-You're welcome. It tastes really good on a cold winter's day. anna-Oh, my mom loves to add parmesan rind to soup. I should do that next time! Love the combination of vegetable soup and basil pesto. Especially now as I've finally managed to grow my own basil. Pesto is a great addition to veggie soup! The start of autumn weather always puts me in a soup mood!